Take the show on the road, the Mobile Presenter is both attractive and interactive. This mobile acrylic display is designed to sit on a table at your tradeshow and attract and engage the traffic passing by your booth. Although nothing at a tradeshow is guaranteed, you can be sure that your perspective customers are looking for something out of the ordinary that will perk up their senses. This mobile display can be used as a touch screen or cutting edge digital signage. Our Portable Tradeshow Display Packages are easy to use, easy to ship, and engage your prospective audience at any trade show or event. Introducing Screen Solutions International Digital Poster People, the latest way to tie static and digital together in a seamless effective package. With over twenty models available and the ability to take your photos and convert them we offer a solution for everyone. 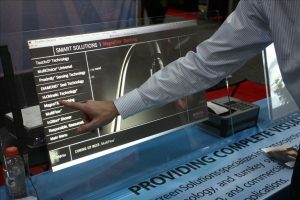 From trade shows to retail displays the Screen Solutions International Digital Poster People always attract attention and interest. Digital Poster People come in twenty different stock configurations, and can also be integrated with our touch screen solutions to make Interactive Digital Signage Displays. This is the absolute best Trade Show Accessory you can add to your trade show booth.